Material Stories of Migration is a collaborative arts project based in Sheffield in which migrants work creatively with local artists and researchers. We use a flexible ‘artslab’ format to spark explorations of the lived experiences of migrants from a wide range of backgrounds, opening up conversations and sharing stories of home, family, journeying and arrival. 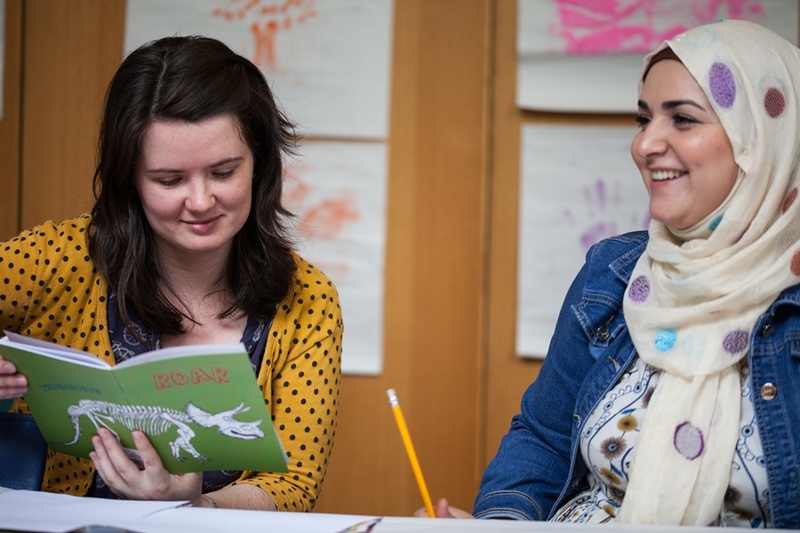 Many participants are new to Sheffield while some have been here longer and have established social networks; some are looking for social and emotional support or wish to supplement learning English with other activities and learn new skills. The project is shaped by the interests of participants and offers an opportunity to write and perform poetry, paint and make prints as well as embroidery and other craftwork. We also use film to diarise and reflect on the imaginative process. We begin with broad themes, for example ‘map’, ‘journey’, ‘home’, ‘story’ and ‘memory’, and responses to these emerge collaboratively, often unexpected ways. Experienced artistic practitioners work with the group in creative writing exercises, painting, craftwork and performance. Researchers and students involved in the project take part in the activities, which makes the process inclusive and not driven by an academic agenda. Often pieces emerge over a few sessions and across media as we try out new ideas. Our aim is to combine the varied skills and enthusiasms of participants with the expertise and vision of artists and the interests of university researchers and students to create work that is valuable to all. The insights offered into the situations of migrants, who are often facing complex challenges, contribute to the work of organisations offering advocacy and support to vulnerable groups in Sheffield and raise questions about social justice, community cohesion and, more broadly, the value and use of creative methodologies. We exhibit work in public spaces in Sheffield and at Sheffield University. We are currently developing our next ‘creative course’ to take place in Autumn 2017 with a focus on mental health and all round well-being. You can watch our short film about the 2016 Material Stories course above, and read the group’s poetry here.